My essay THE STORYLLER OF NEGATIVE SPACE: WRITING IN THE WORK OF SUSAN HILLER has just been published in Fillip 11. The issue is currently available in print only, but will soon be archived here. 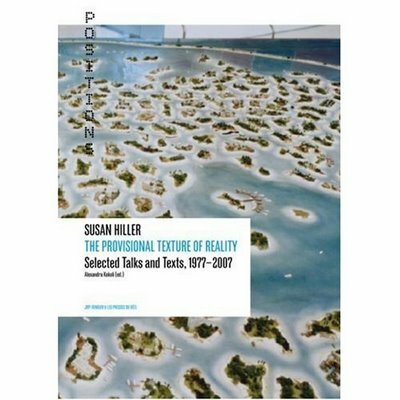 My contribution began as a review of Susan Hiller’s THE PROVISIONAL TEXTURE OF REALITY: SELECTED TALKS AND TEXTS 1977-2007 (JRP Ringier, 2008), edited by Alexandra Kokoli. Particular in the context of much contemporary interest in text- based artistic practice and performance lectures, I was interested in Hiller’s insistence throughout the book that her talks and writings are not artistic work. I wanted to unfold some of the implications and assumptions in this decision, one which seemed particularly curious in a practice unfolding through a challenging of existing boundaries and, often, a focus on written text of various kinds. In a way, this is a collection of detours around the subject, circling in on it. It’s like a drawing, where the negative space is as important as the marks, and where individual marks don’t mean much on their own. In the process, I’ve found my lines of thought converging or overlapping to define a tentative shape that may represent a sighting or wish for something that will emerge more clearly in the future. Re-reading the essay now I am also struck by how this relates to the book form. Hiller has made numerous book works throughout her career, but her practice has also remained relatively resistent to a satisfying monographic treatment. Kokoli’s collection and, particularly, the earlier THINKING ABOUT ART: CONVERSATIONS WITH SUSAN HILLER edited by Barbara Einzig (Manchester University Press, 1996), remain, I think, the best book-based ways of approaching Hiller’s practice. This essay, then, explores a reading where these conversations, statements, transcripts, notes, and written lectures are not separate from art-production, becoming more than a supplementary, ontological preoccupation. One consequence of such a “detoured reading” is to become unsure of the spatial metaphors and language by which an artistic practice is understood. Texts acquire uncertain status, individually and as a whole. I suspect Hiller’s recurring preoccupations – including psychic phenomena and ethnography- may offer up different meanings and insights when the work she produces to explore them is not positioned on one side or the other of an art-not art divide. Re-framed, too, are questions of what legitimizes these texts. Of course, Hiller’s status as an established artist prompts the invitations in response to which most of these texts are produced. Yet Hiller’s way of responding often evokes different kinds of knowledge: the artist working with questions arising from their own practice alongside a scholarly focus on context and historiography. Does status accrued as the former legitmize reflections in the guise of the latter, or instigate a particular artist-scholar practice? Are we to gain reassurance from Hiller’s “former-anthroplogist” status? If, as Hiller would seem to prefer, we foreground a particularly artist-led perspective, then what does that mean for texts that are denied a position in Hiller’s catalogue of art production? An initial strategy for thinking through these questions might be to think of Hiller as an oral storyteller. 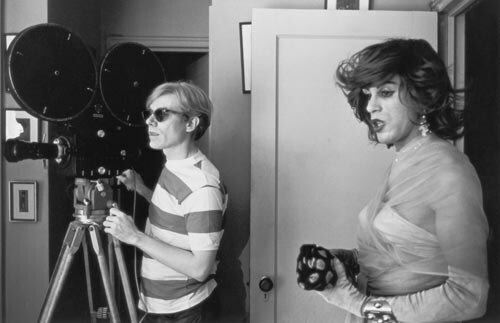 What links these texts – and differentiates them from the majority of her art production – is the direct physical presence and voice of Hiller herself, weaving variations on familiar themes, often – like the artist herself – known to their audience, with a meta-structure connecting (art) history with the individual (Hiller’s practice). 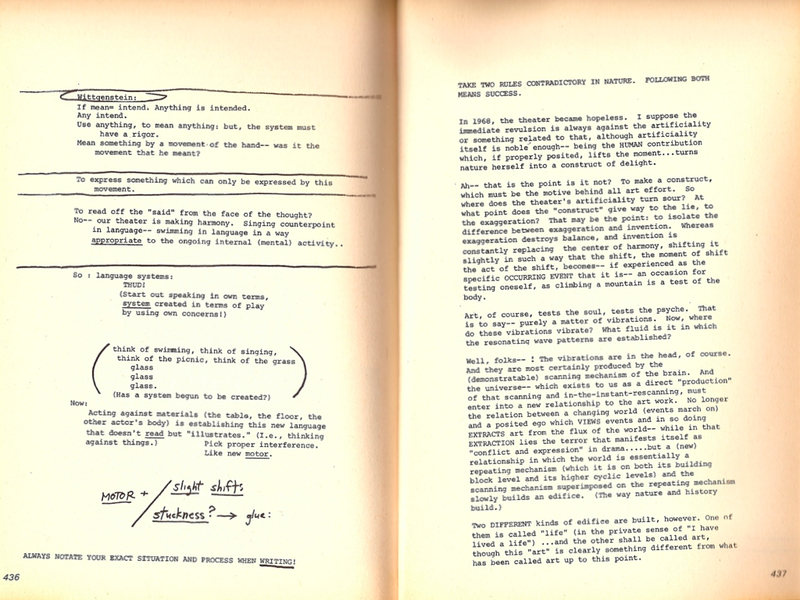 Note, too, that Hiller rarely strays from a conventional, expository prose style, with an absence throughout the book of the process notes, fragments, doodles, as well as unconventional grammatical or structural devices, that often figure in “artists’ writings”, both those construed as art works – Sue Tompkins’ texts, for example – or those positioned as in proximity to rather than being the art work – a non-definite distinction but one evident in recent art-writing journals such as The Mock and other superstitions and Material. 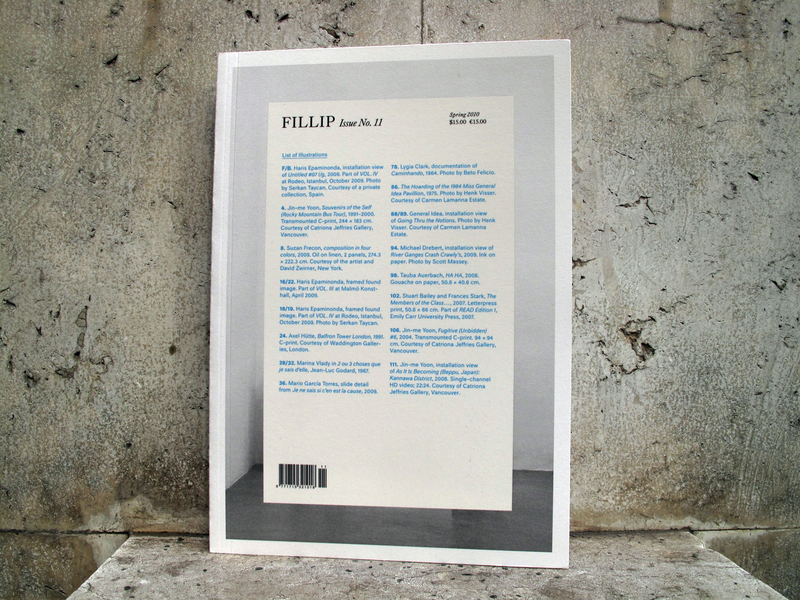 Fillip #11 features contributions from: Lawrence Rinder, Haris Epaminonda & Jacob Fabricius, Arni Haraldsson, Keith Bormuth, Alex Kitnick, Jamie Hilder, David Berridge, Michalis Pichler, Milena Tomic, Renato Rodrigues da Silva, Gabrielle Moser, Antonia Hirsch, Aaron Peck, Kim Dhillon, Kate Armstrong, Liz Park. As part of putting together the VSK project for The Reading Room, I have been thinking about the folio as a form of publication, attracted by its sense of a gathering of materials, its openness to re-arrangement, how it could propose/be some new event, rather than/ as well as chronicling something that has already happened. This text is alone on the cream card, haiku-redolent, the folio dependent on this careful juxtaposition, rhythm and shift of materials. Actually, the order of materials was somewhat different in my copy, as if someone had already re-arranged the materials into a – for them- more workable arrangement. 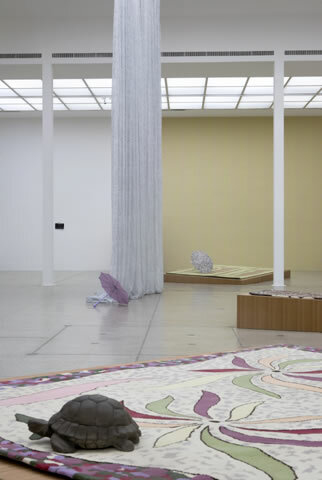 In order there were: six patterns, printed on card; a facsimile handwritten letter on different sized headed notepaper, from hotels from Los Angeles and Baden Baden; a brochure containing “exhibition views” and an essay by Silvia Eiblmayr. I wanted more but perhaps the folio is best conceived as a minimal juxtaposition and agglomerating. Something light, but also an amassing and clotting. The letters on their cream paper invite us to view the artist through his handwriting, the facsimile headed notepaper seeking a re-creation of an idea of luxury, alongside evidencing the often traveling contemporary artist. Letter begins with MC emerging from his LA hotel to scene of apocalypse which, after a moment of adjustment, he identifies as a film crew shooting a scene from Alien. The mix is one of a number of differences and connections that unfold in the letters chatty but formal informality, including, most principally, the relations of Vienna and LA. What I am proposing is that the fractured continuum of history was such that the true spirit of Viennese Radicalism was, in the 1920’s and 30’s largely transposed to California. 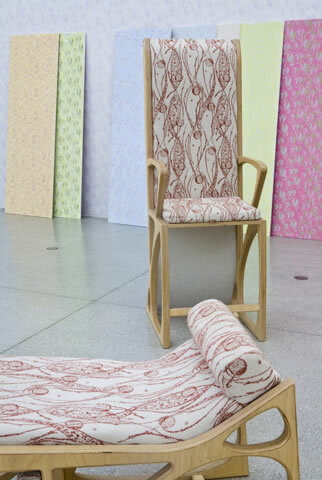 Here then is a statement of the network that informs Chaimowicz’s work, both of his time in Vienna, his relationship to Vienna, Vienna itself, his own broader practice and the relations it involves and imbricates between high and low culture; art, design and furniture. I imagine a methodology composed of a conceptual choreography between these two quotations. Writing of Chaimowicz’s Vienna Triptych – a series of tall panels aligned along the wall, some patterned and some arrangements of photographs – Eiblemayr seeks to clarify this position. In the context of VerySmallKitchen – but also informed by Chaimowicz’s own writing practice – I found this to be outlining a form of writing. Once again he [Chaimowicz] raises questions about public/ private dichotomies, and relates the intimate, personal interior that also incorporates the artist’s physical presence with the particular location and its visitor, the city, its history and the specific memories associated with it. 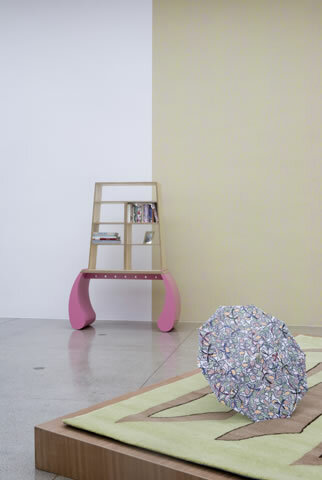 In formal terms this means that in his work… he again maintains the status of his materials and resources open and moveable, refusing to categorise, preferring instead to sustain the tension of ambivalent determination between the everyday object and the objet d’art, the piece of furniture and the sculpture, the décor and the painting. 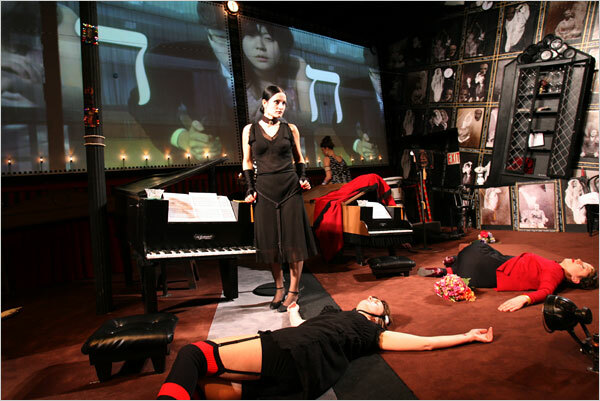 In doing so he creates a performative space that draws the viewer in to form part of a theatrical experience, i.e. an experience that is real in terms of both space and time. A good model for writing this, based on one piece in the Secession show: a wonky table that convinces you the floor itself is uneven. I construct my own folio featuring this text and others by Chaimowicz: the appropriation of The World of Interiors magazine (for a book work accompanying show at Migros, Zurich 2006); the revealing interview in the recent FIELD WORK publication (a brief citation from which is here). A collected writings to come, hopefully, later this year. 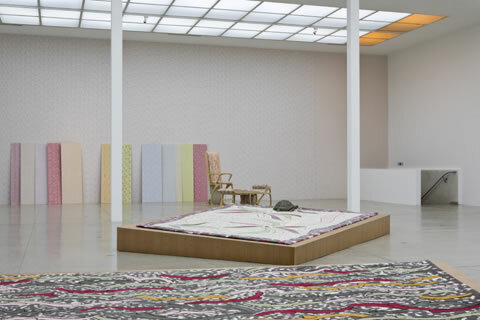 All, as in the panels of Vienna Triptych, offer a certain space for folio-thought, a space also formed and forming in the parasol “scattered” in the installation at Secession, the appropriations of rug (on plinth), appropriated and re-configured ( I wanted to say “sensibilised”) chairs and tables. JEAN FISHER: less concerned with the specificity of place than with the evocation of an abstract mental space in a visual structure that is equivalent to a musical score, in which quietude is orchestrated with crescendo, harmony with rhythm. A NOTE: I first encountered Richard Foreman’s ONTOLOGICAL HYSTERIC THEATER: A MANIFESTO in Kate Davey ed. 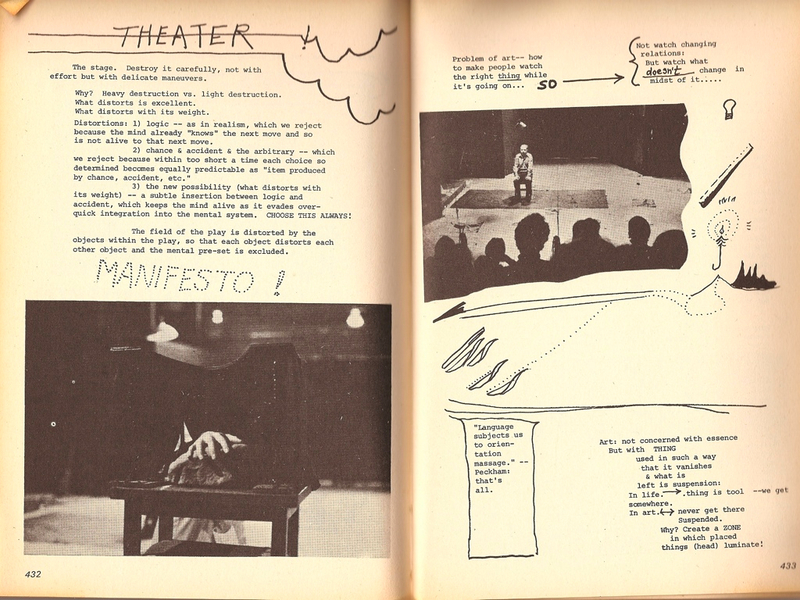 Richard Foreman Plays and Manifestoes, published by NYU Press in 1976. 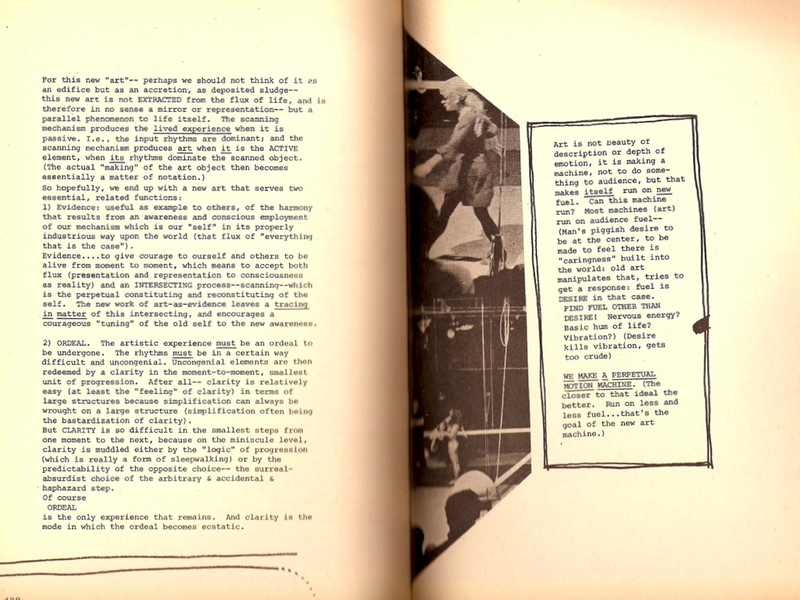 It also appeared in Richard Kostelanetz anthology ESSAYING ESSAYS: ALTERNATIVE FORMS OF EXPOSITION (Out of London Press, 1975), from which the above images are scanned. 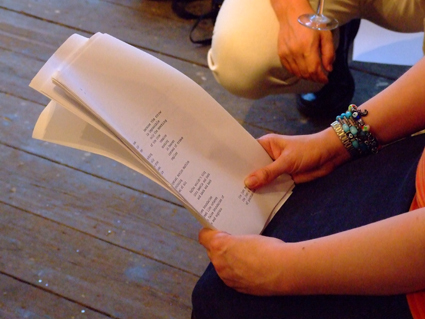 I have included the essay in several workshops and gatherings of material – such as CRITICISM TOWARDS PERFORMANCE NOTATION, a short presentation as part of SPILL: OVERSPILL, and a workshop on the visual essay as part of the FREE PRESS workshop, some notes on which can be seen here. 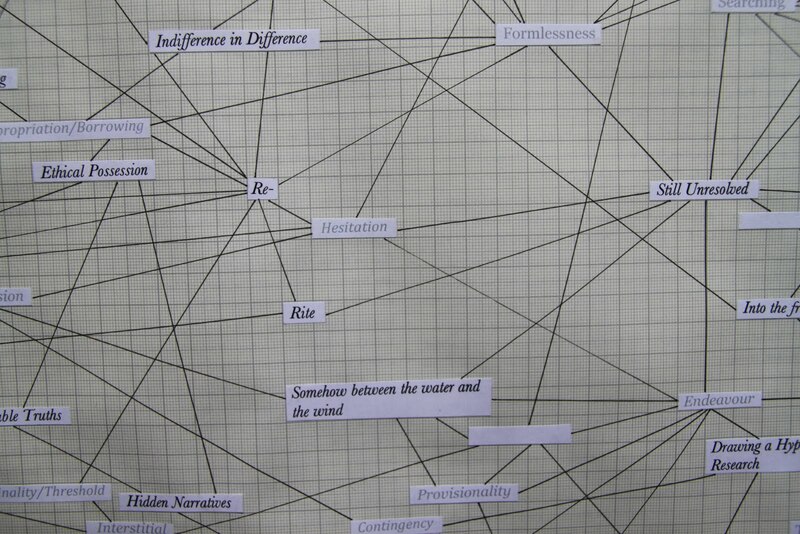 Most recently, I returned to it as part of a presentation on artist uses of the diagram at London’s FormContent. I showed slides of Foreman’s essay at the point in my talk where I was trying to suggest what a diagrammatic artistic practice might be, thinking less about a practice of literally making diagrams and more about a practical and conceptual arrangement of a working practice as a diagrammatic spatial unfolding. I also find myself thinking about this text in the light of current art debates on alternative forms of education. Foreman’s text remains vital for me in how it links together together traditions of essay, performance script, and open field poetics, as well as its establishing of a creative interchange between spaces of page, mind, and stage. I find here writing that comes before, during and after the act of theatre making itself, that is about an event and process, but also an intensity of experience now (a “now” that is ever adaptable: the moment of writing, the moment of reading both pulsate in this text), as well as being a projection and prosthesis for a theatre activity that will take place in the future. An essay shifting between registers – reflective and impetuous, handwritten, typed, photographed and drawn – to create a space in which thought is actively taking place, or at least is a possibility. Foreman has written essays like this throughout his career, although not perhaps with the eclecticism of approach evidenced here. 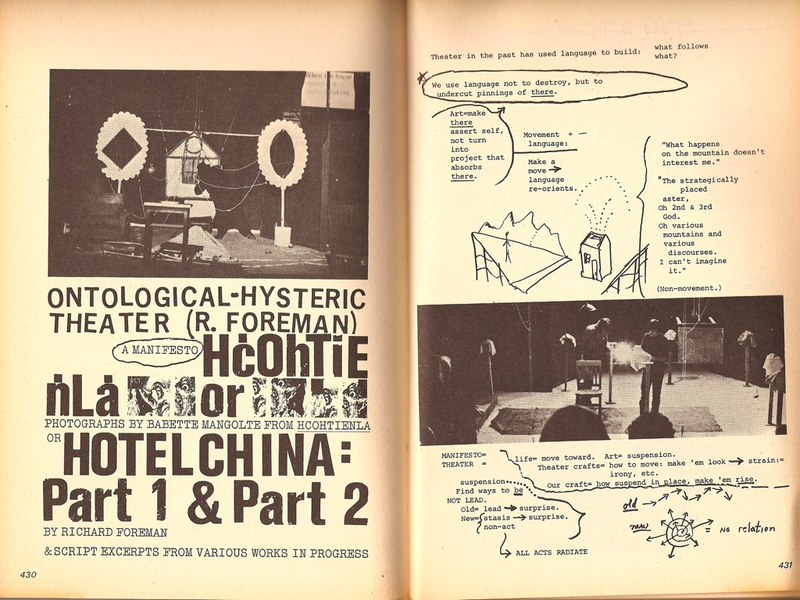 See, for example, “How to Write a Play” and “The Carrot and the Stick” (both 1976), reprinted (along with Ontologic Hysteric Manifesto) in the PAJ Art + Performance anthology of essays on Foreman. I’m struck, looking at these texts, by Foreman’s observation in interviews that his texts are far ahead of his directing, that the texts evidence a spatial and thematic complexity his theatre productions themselves lack. 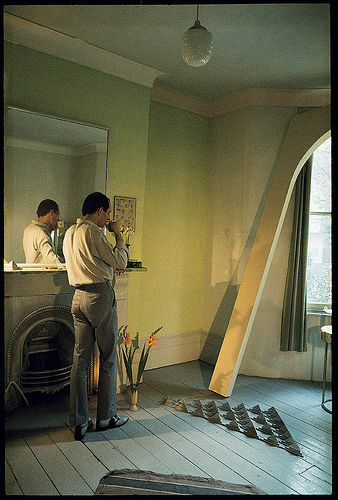 I’m also thinking of his scenographic sense of the multiplicity of space, always creating multiple points of focus and intention, anti-absorptively interrupting a moment – strings criss-crossing the stage in photos of many early Foreman productions – how such forms of stage composition apply to the page and writing. I’ve not seen Foreman’s work live, his work the prime exemplar for me of a practice whose relevancy and urgency to my own work is a reconstruction through text and image. 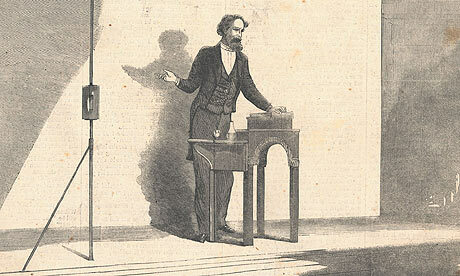 By re-printing the texts here, perhaps I’m hoping for the same effect as Foreman, when he posted his notebooks online with the invitation for others to use them in the making of a piece of theatre. 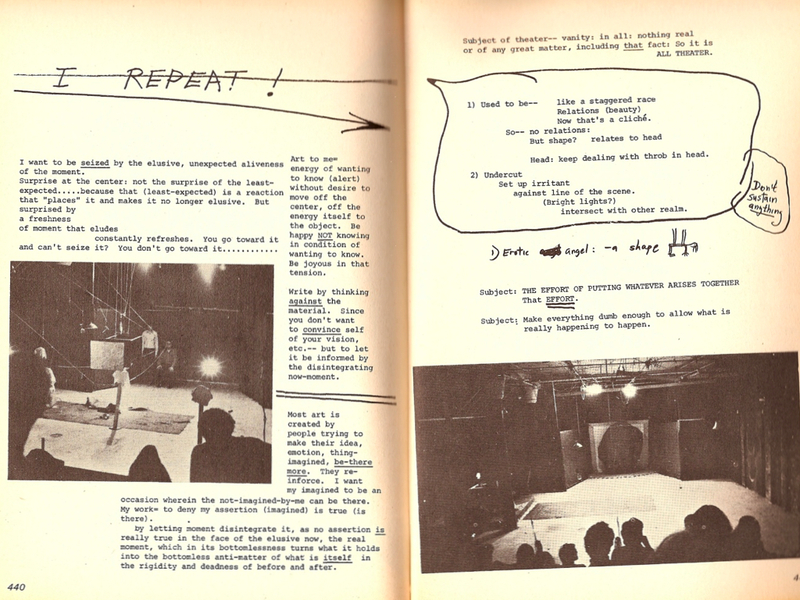 If those notebooks seem too close to Foreman’s own process to initiate an autonomous theatrical interpretation, perhaps the essay form – conceived by Foreman as an active think-performance-writing-space – can be prompt and tool for very different forms of writing, performance and other creative practice. 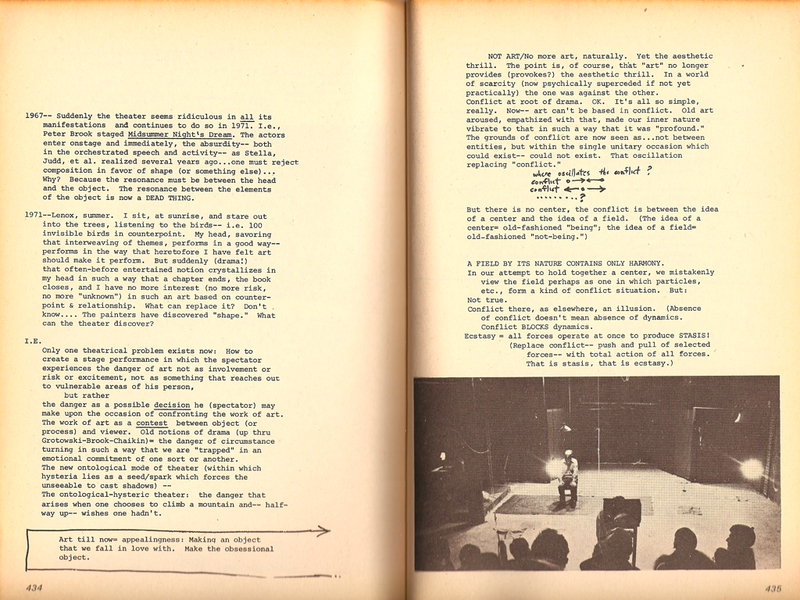 Regarding Foreman’s own practice, the manifesto re-printed here is testimony to an engagement with theatrical experience and space which now appears to be over. In the week after READING FOR READING’S SAKE I came across a number of quotations that developed and nuanced the space of “reading as activity” opened up by that event. David Levi Strauss, From Head to Hand: Art and the Manual (Oxford University Press, 2010), 165. Read in Gordon Square WC1London, 12 April, 2010, instantaneously applying quotation to a networked “everything corresponds” model of reading. 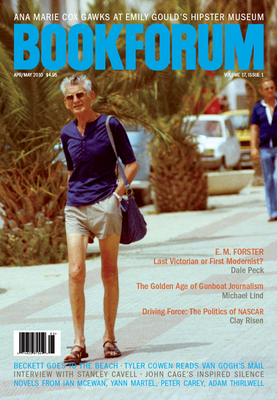 Joan Richardson, question to Stanley Cavell, “The Transcendental Strain: Stanley Cavell Talks with Bookforum”, Bookforum, April-May 2010, 5-6. Read on 15.55 train from Leeds to London, 11 April, 2010. Thinking here about the musical spaces between books, also how books could resist a linear read-through and consumption, shifting attention into a broader engagement with all levels of their material architecture. 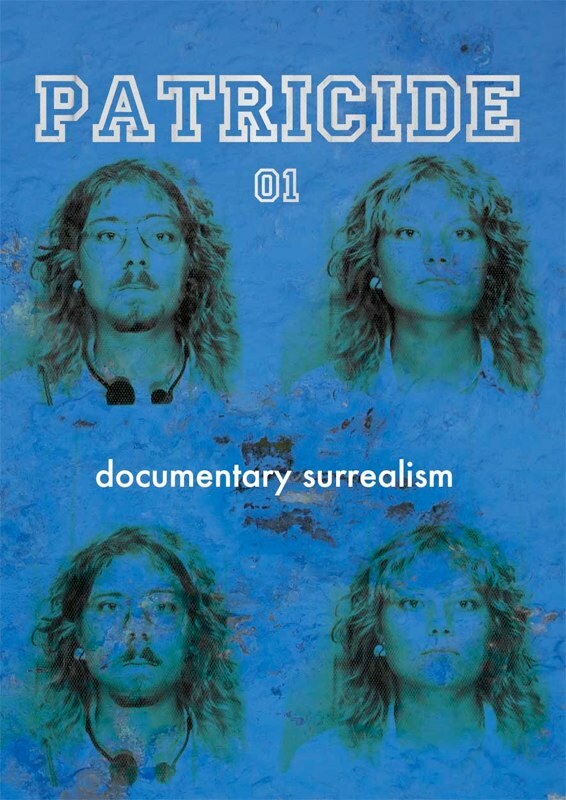 Jesse Gentes, quote from “Impossible Emancipation” (2009), cited in Patricide: Issue One: Documentary Surrealism , purchased and read at Cornerhouse, Manchester, 9th May 2010. I made some notes for a possible contribution, but they lacked the sense of project I remembered from Paul Nash’s writings on the subject (first published in the 1938 issue of Architectural Review). 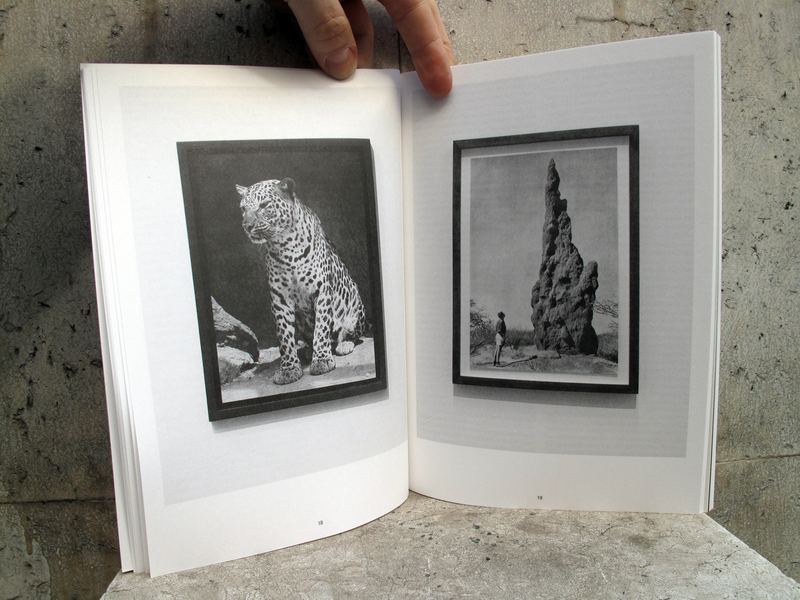 PROJECT: read widely in surrealist literature, but without concept of unconscious. 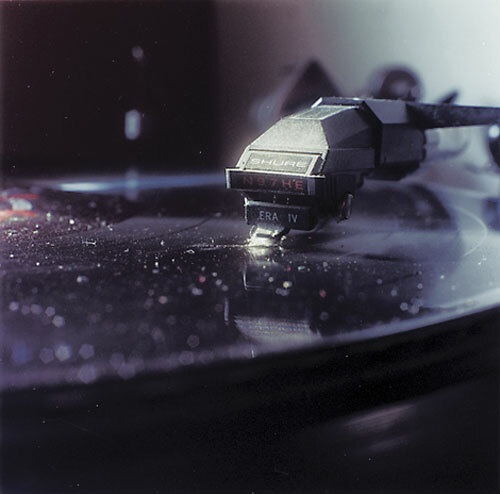 Moyra Davey, Long Life Cool White: Photographs and Essays by Moyra Davey, (Yale University Press, 2008), 85. At home, evening, Whitechapel, London 12 April 2010. 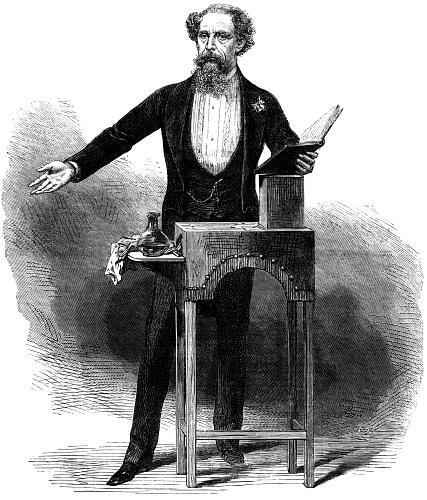 Davey talks of the flanerie of reading – a concept which captures the entwining intention between reading as WORK and as indulgence, and what circumstances determine the readers self-positioning on this spectrum of value. For Davey herself the (w)readerly result is an associative, diaristic, unfolding essaying, and a photograph practice where a formal materiality of reading (and other activities – see image below) acquires its own (irr-)resonant psychology. SAMUEL BECKETT ON HOLIDAY: Walking into the Cornerhouse bookshop on 9th May 2010 I immediately noticed the photo of Samuel Beckett. 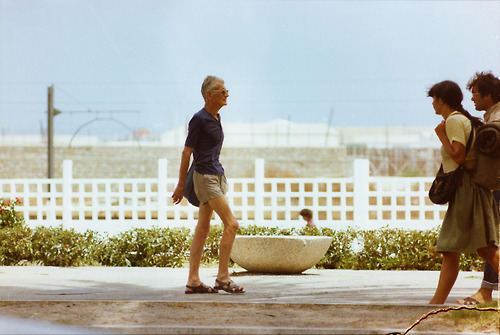 It’s from Beckett: Photographs by François-Marie Baniera , including several, like those here, of SB on holiday in Tangiers. I liked how this liberated Beckett’s texts from the moody black and white images that often appear on his books. 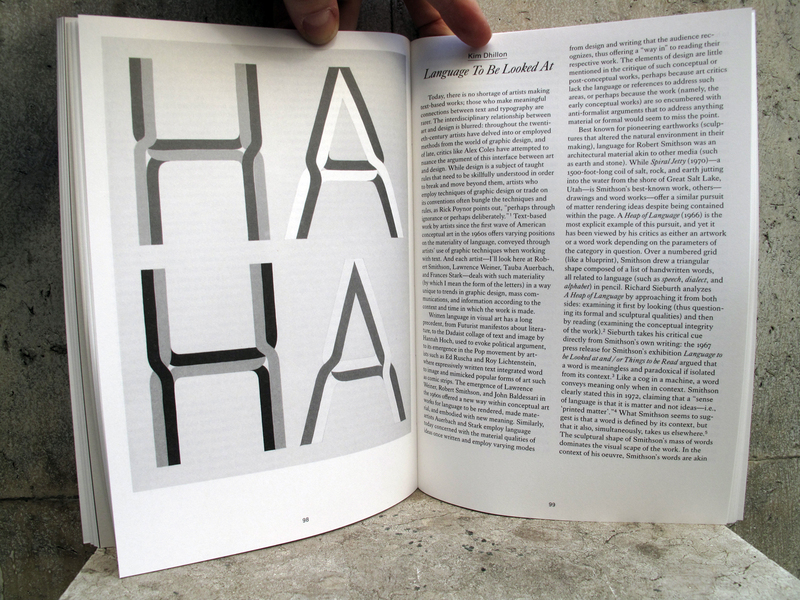 In the context of “reading as publishing” I also liked how this photo appeared to published the emotion of my own experience of reading Beckett, finding a certain reassuring joy in the certain ontological ground (or non-ontological non-ground ground) that Beckett seemed to write. 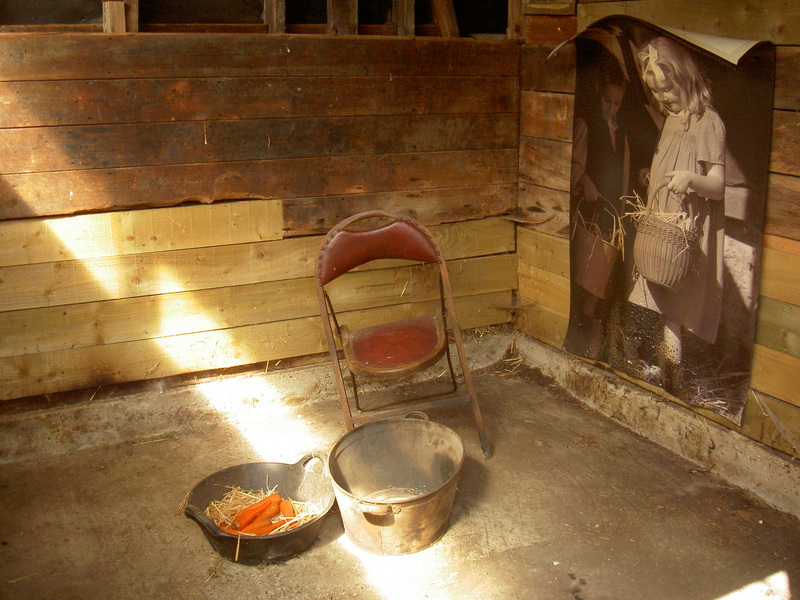 The photo also loosens up the relationship between Beckett’s life and work, suggesting a possibly more paradoxical and tangential relationship than the black and white icons which attempt to map Beckett’s physical image onto his writings and vice versa, like some primitive neo-Victorian science of physiognomy. Thinking of the materiality of a book and its reading, that’s what I don’t want “reading as publishing” to be. Operating under the title ‘Not Yet There’, my practice is characterised by a mode of restlessness – or wandering – that functions as both the subject of and motivation for my enquiries. 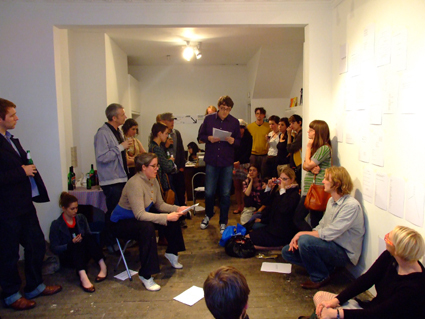 Writing/text-based work (often developed dialogically through conversations with other artists) interrogates the critical and creative potential within experiences or conditions such as failure, doubt, deferral, uncertainty, boredom, hesitation, indecision, immobility & inconsistency, by exploring models of practice – and subjectivity – which resist or refuse the pressure of a single or stable position by remaining willfully unresolved. I am interested in exploring the ‘thinking space’ of practice by shifting attention from the notion of the ‘deliberate’ towards the process of ‘deliberation’; by insisting that purpose or meaning is not synonymous with the notion of achieving a ‘goal’. Emma’s field notes are below. Notes by Rachel Lois Clapham and Mary Paterson are here and here. A hard copy edition of this text work will shortly be published. The project will be developed for VSK’s exhibition at The Pigeon Wing in September. In terms of responding to the David Berridge’s proposition of ‘Field Station’ I have attempted to map a field and propose it as a field station; the text/objects that I presented are both reflective and prospective, (like Breton’s ‘double headed-arrow’) they mark the territory of what has come before but also suggest a possible future use. * Verb: The action or process of building (of assemblage) (how is it produced, what is it methods). Field as an act or of doing something: a sphere of activity, to put into action, a complex of forces that serve as causative agents in human behaviour. 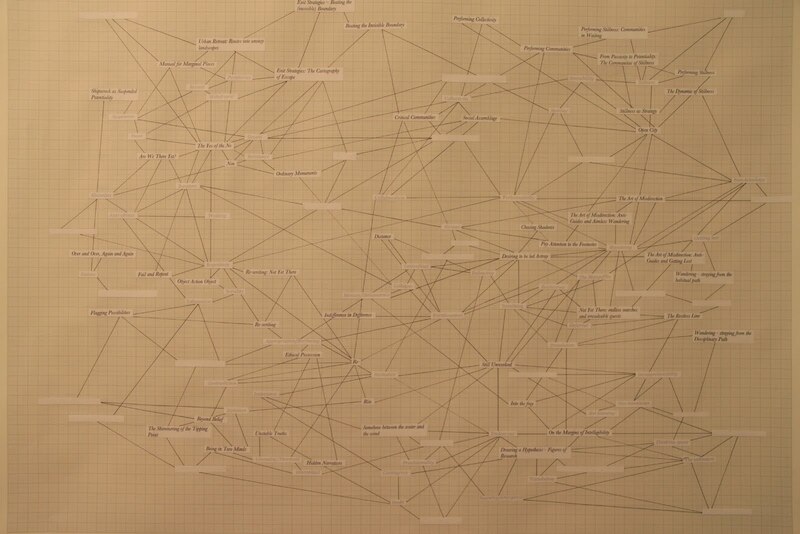 * A mapping or rhizomatic field (the network of ideas, practice, bodies – field ascommunity). An attempt to articulate or map or chart or diagram a sense of my writing practice, which operates under the title, Not Yet There. The tension between or field created between different practices (art/encyclopedia; ‘knowing’/knowledge; the gallery/the academy). 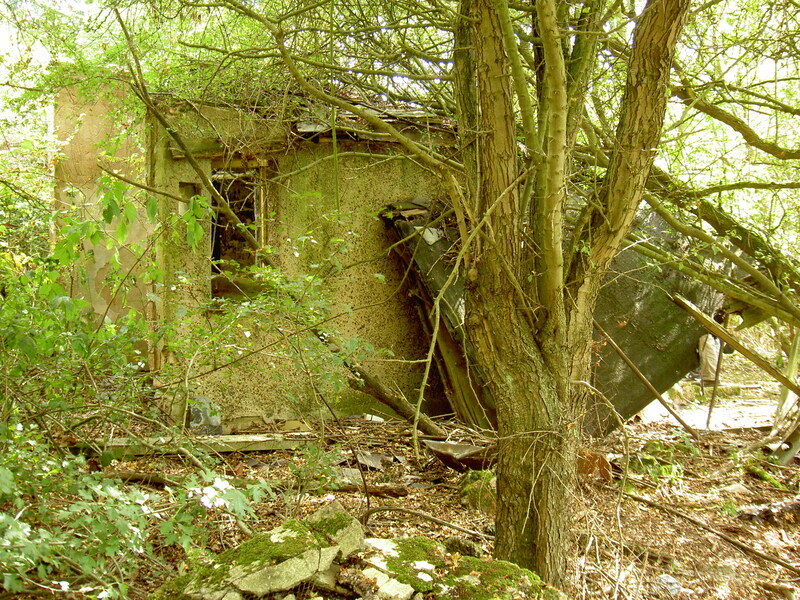 * Field Station – what constitutes a (art-writing) studio and how can this be made portable or mobile or taken to the ‘field’. Studio as constituted by a set of practices (produced); by the physical surroundings (belongings) and by what it affords (thinking space). NB) In order to build in spaces that are more speculative you have to build in spaces that are more speculative. Mind-mapping habitually presupposes a starting point, a point of original. Here my attempt is to remove the need for a fixed or determined start, or rather to replace the propositional of the conventional starting point with the notion of a potential Macguffin. 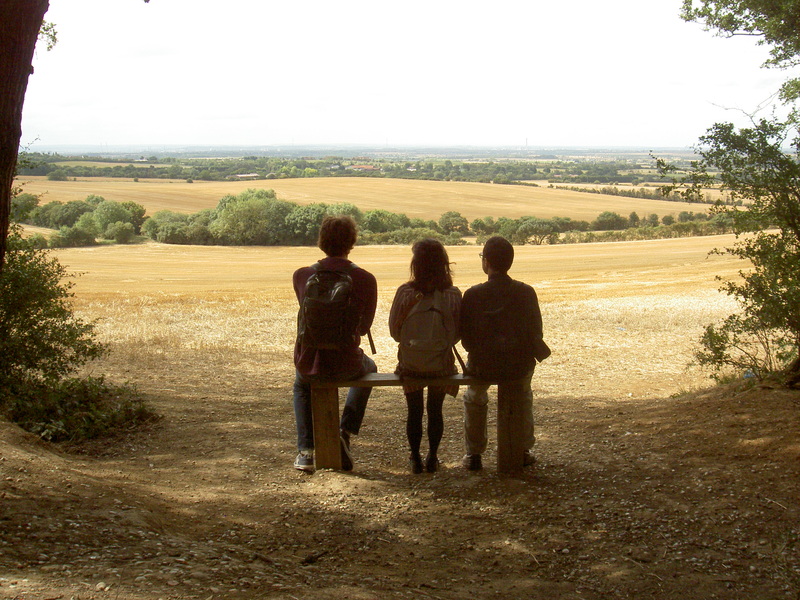 * Open Field (as open space – thinking space) – a template, work and tool. An imaginative proposition and an operational model. An attempt to articulate or map or chart or diagram the idea of the ‘field’ as open space, a space of thinking, a germinal terrain. Mapping the process of thinking, without this being about what that thinking is about; a mapping of a process and the producing of a map that corresponds to that process. * An operational model: using the ‘field’ model as a device through which to explore my field of art-writing practice. 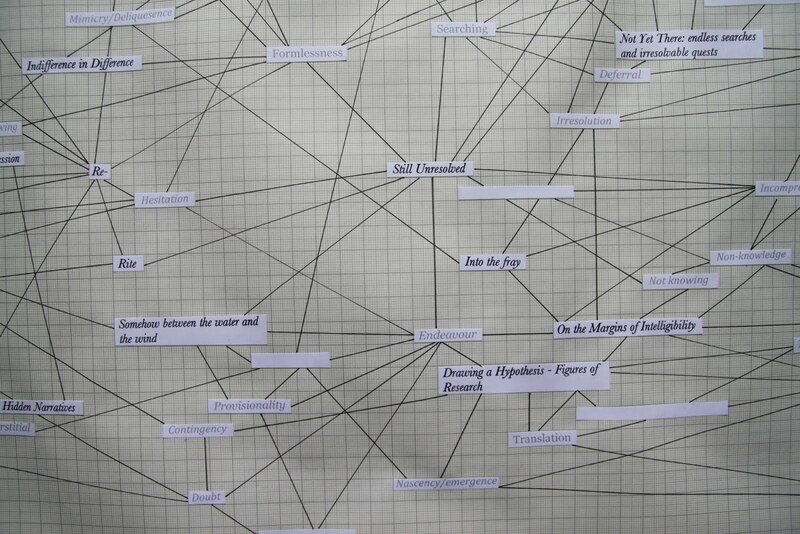 A proposition of an essay as map, the essay as a network or proposed community of ideas. The field as essay. 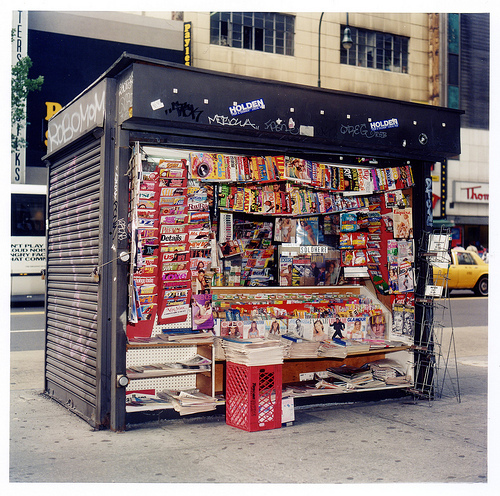 Visual essaying (essay as rhizome). An attempt to use this open field as a device to lay down (or seed or plant) a few specific ideas. A model to be used: what is the field of this event? * Space of Contestation: a battleground. * Force/Agency: (physics) the influence of some agent, as electricity or gravitation, considered as existing at all points in space and defined by the force it would exert on an object placed at any point in space. * Horizon: (optics) the entire angular expanse visible through an optical instrument at a given time or (photography) the area of a subject that is taken in by a lens at a particular diaphragm opening. * Interconnectedness: (psychology) the total complex of interdependent factors within which a psychological event occurs and is perceived as occurring.